Draperies and blinds were used prior to installation. In addition, employees strategically taped pieces of paper on the windows to reduce glare. The average size of the windows was twenty-nine square feet, and each application took approximately six to seven minutes to complete. Ford Motor Company found it challenging to maintain comfortable temperatures for employees year-round in its forty-year-old headquarters in Detroit - a twelve-story building faced almost entirely with glass. Glare from the sun also made it difficult for employees in the building to see computer screens. 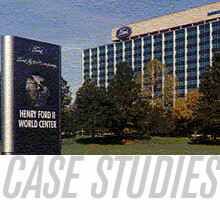 After forty years of trying various fixes to control temperatures in the building, Ford's problem was solved when Specialty Protective Coatings, a 3M-authorized Dealer Applicator in Bloomfield Hills, Michigan, applied P18ARL Scotchtint window film to every one of the building's 3,083 windows. According to company owner Mike Roeder, Specialty Protective Coatings covered more than 83,000 square feet of glass. And, due to the expertise and efficiency of Specialty Protective Coatings' experienced crew, the project was completed six weeks ahead of schedule. While the most important outcome has been improved comfort for its employees, Ford says the company is now enjoying the benefits of an energy consumption reduction that could save them an estimated $57,000 a year. Prior to the installation, Ford could cool the building to no lower than 80° on hot summer days. Now, even on 90° days, the building's temperature stays at a comfortable 72°. The company also enjoys the benefits of the building's improved appearance and the reduction of glare on computer screens. In the building's Trading Room, for instance, Ford employees had not been able to open their drapes for more than seven years because the sunlight made it difficult to see their computer screens. Now, those same employees enjoy being able to look outside during working hours. Ford had three proposals, but only one from a 3M-authorized Dealer Applicator. "They had seen our work before; and they liked the idea of using a 3M product because 3M has a great reputation," says Roeder. "That had a lot to do with selling the project because Ford knew that 3M would stand behind their service and their product."